You'll be £6.80 closer to your next £10.00 credit when you purchase When the Moon Rises. What's this? In the face of the advancing Allied forces, Italy capitulated in September 1943, leaving thousands of Allied prisoners of war held in camps around the country to fend for themselves. Amongst those prisoners was Tony Davis who had been captured in North Africa. Determined to make the most of the opportunity, with two fellow companions in arms Tony set off on a 700-mile walk through German-occupied Italy with nothing to sustain them other than an almost schoolboy-like enthusiasm.rnrnThe story of their adventures was received with great acclaim when this account was first published in 1973, and When the Moon Rises takes the reader on a roller-coaster journey through Italy from the River Po to Calabria, meeting a cast of exciting and voluble characters en route. Regardless of the ever present risk of re-capture, Tony Davis and his comrades enjoyed street parties and drinking binges with the cheerful Italians who were happy to be no longer fighting the British. rnrnRepeatedly chased by the Germans, the tension mounts as the story reaches its dramatic climax, the little band never failing to maintain their wit and humour. 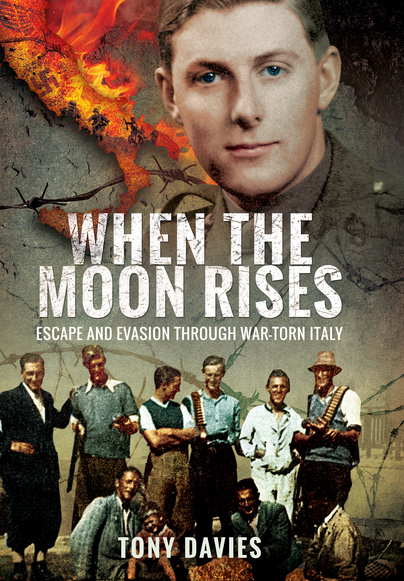 When the Moon Rises is one of the classic escape stories of the Second World War. Born in 1920, Tony Davies was educated at Mercer’s School in the City of London. At the outbreak of war he joined the Honourable Artillery Company and was commissioned in the Regiment in 1940. He served in North Africa and Italy. After the war he studied medicine and, having qualified in 1953, practiced in Surrey. He died on 23 February 2006, aged 85.